(CBS/AP) VIENNA - Iran has effectively shut down a probe of a site suspected of being used for work on nuclear weapons development while doubling the number of machines it could use to make the core of nuclear warheads at an underground bunker safe from airborne attack, the U.N. nuclear agency said in a report Thursday. Senior diplomats familiar with the International Atomic Energy Agency's latest report called both developments troubling, while cautioning that it was unclear how many of the more than 2,000 centrifuges now installed at the were operational. They noted that agency inspectors did not have access to check their inner workings. The two diplomats, who are familiar with the IAEA's Iran investigation, demanded anonymity because they were not authorized to comment on the confidential report. Importantly, the report noted that Iran had not significantly increased the pace of either low or higher-level uranium enrichment. It noted that less than 700 of the machines  all producing higher level material at 20 percent  were operating at Fordo, and about 10,000 were turning out lower-level enriched uranium at another site. Those are approximately the same numbers as mentioned in the agency's last report in May. The report also noted that Iran has turned much of the uranium that was enriched to the higher, 20-percent levels into reactor fuel plates that are difficult to retool into fissile warhead material. As a result, it is still far short of the amount of higher enriched uranium it would need to quickly enrich the element further to weapons-grade levels. While Iran already has enough low-grade enriched uranium to make several nuclear weapons, that process would take long enough to send alarm signals to the outside world. Paul Brannan, a senior analyst at the Institute for Science and International Security, told CBSNews.com earlier this year that Iran likely designed and built Fordo to be the "breakout" facility - where their ostensibly civilian nuclear program would quietly push forward into the weapons development realm. Fordo is "obviously for nuclear weapons hedging, to preserve centrifuges in case of an attack" on other, more vulnerable facilities, added Mark Fitzpatrick, an expert on Iran's nuclear program and the director of the nonproliferation and disarmament program at the London-based International Institute for Strategic Studies. Tom Z. Collina and Daryl Kimball of the Washington-based Arms Control Association said the common assumption is "that if Tehran were to decide to 'break out' and race to build a bomb, it would try to do so by using its still small stock of 20-percent enriched uranium." They called the IAEA report "another troubling reminder of Iran's proliferation potential," while describing it as "not a 'game-changer' in terms of Tehran's capability to build a nuclear arsenal if it were to decide to do so." Iran denies any interest in nuclear arms, insisting it is enriching uranium only to make reactor fuel and medical isotopes, and for scientific research. Still, concerns have grown about its ultimate aims because it has refused to stop enriching uranium despite increasingly severe international sanctions and outside offers of enriched material for its stated needs. Iran's ambassador to the IAEA, Ali Soltanieh, dismissed threats of an Israeli attack. "No one dare think of it or dare to attack," he told CBS News correspondent Margaret Brennan in Tehran this week. "Any sort of aggression will be harshly greeted with an iron fist." Asked about the latest report, White House spokesman Jay Carney told reporters that President Barack Obama "has made clear frequently that he is determined to prevent Iran from obtaining a nuclear weapon and he has led an unprecedented effort to pressure Iran to live up to its obligations." "The window of opportunity to resolve this diplomatically remains open but it will not remain open indefinitely," he said. In Tehran, Ayatollah Ali Khamenei, Iran's supreme leader, denied his country wanted such arms, describing the pursuit of nuclear weapons on Thursday as a "big and unforgivable sin." But he insisted Tehran will not abandon its "peaceful" atomic program. "I declare that the Islamic Republic of Iran has never been after nuclear weapons and it will never abandon its right for peaceful use of nuclear energy," Khamenei told a summit of 120 nations that call themselves nonaligned and generally share distrust of highly developed Western countries they view as suppressing their rights. 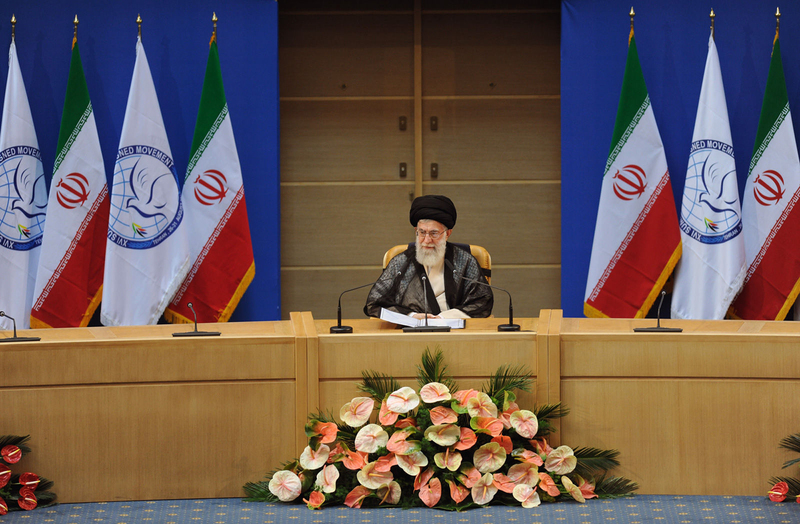 Khamenei singled out the United States, which accuses the Islamic Republic of trying to reach the nuclear weapons threshold, by calling Washington's stance a "bitter satire" because of the size of America's nuclear arsenal and its use of atomic bombs against Japan during World War II. Khamenei, who has final say in matters of state, has denied that Iran harbors nuclear weapons aspirations before, and U.S. State Department spokesman Patrick Ventrell said Washington was not reassured by the supreme leader's comments. "We have heard that before, but mottos and pledges and slogans are one thing," he told reporters, adding, "we have not seen them come into compliance" with international demands. Aside from enrichment, suspicions that Tehran is working secretly on developing various components of nuclear arms have also added to international concerns about its intentions. Thursday's report confirmed that a building at Iran's southeast of Tehran, which was suspected of having been used for nuclear weapons-related experiments, has been covered with pink shrouding. That effectively blocks the U.N. agency's attempts to monitor a suspected cleanup of the site. The agency has tried  and failed  to gain access to the site since February. When it does, "its ability to conduct effective verification will have been significantly hampered" because of the alleged cleanup and then the covering of the site, said the confidential report circulated among the IAEA's 35 board member nations and forwarded to the U.N. Security Council. Soltanieh told CBS News that Iran's nuclear enrichment is progressing unhindered by the myriad international economic sanctions against his country. He claimed Iran is willing to give inspectors access to its nuclear sites, but that the nuclear watchdog agency has failed to produce documented evidence of its suspicions over specific sites. Because of the lack of Iranian cooperation, however, the agency said in the report that it "is unable to provide credible assurance about the absence of undeclared nuclear material and activities in Iran, and therefore to conclude that all nuclear material in Iran is in peaceful activities," said the report.